Advanced technology takes Wolfgang's Deep Gloss to the highest level! The Wolfgang High Gloss Kit gives you two options to take your reflections to the next level. Wolfgang sealants are engineered to give you the benefits of a high gloss paint sealant with the shimmering deep gloss of a carnauba wax. Both Wolfgang Deep Gloss 3.0 and Wolfgang Deep Gloss Liquid Seal feature the latest advances in paint protection technology by utilizing the latest in German engineered Super Polymers. Use each product separately or layer them to create Wolfgang's Concours look on any paint color! Wolfgang Deep Gloss Paint Sealant 3.0 replicates the best qualities of carnauba wax � slickness and shine � but it has more than double the longevity of the average carnauba wax. Just a few drops will produce a show-stealing shine that withstands the elements, ultraviolet rays, infrared radiation, salt water, and environmental pollutants and armors your paint for months. The Deluxe Jr. 600 Microfiber Towel is perfect for buffing because it has a deep pile where dirt and dust can accumulate away from the paint, rather than being rubbed into the paint. Plus, the long, silky microfibers do an excellent job of massaging away fingerprints and smudges. Use this towel for wiping away residues, streaks, and smears while pampering the paint in luxury. The Microfiber Applicator features high quality microfiber wrapped around a foam core sponge. The result is an ultra high quality microfiber you grab in your hand and use for applying Wolfgang Deep Gloss Liquid Seal with streak-free ease. You can wash and reuse this microfiber applicator for all of your detailing needs. The Poly Foam Wax Applicator makes it easy to apply Wolfgang Deep Gloss 3.0 Paint Sealant with perfect uniformity. These soft, high-quality, applicator pads lay down extremely thin uniform coats without scratching or dulling the paint finish. 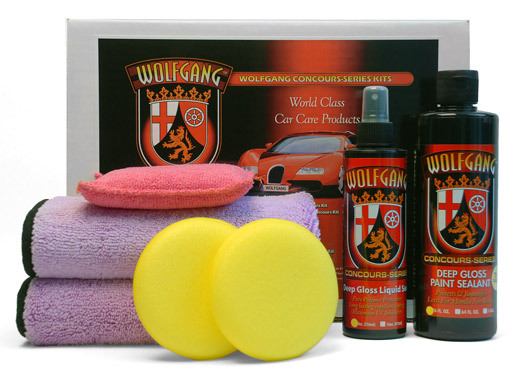 Wolfgang Concours Series is a collection of world class car care products. Wolfgang's cutting edge German Super Polymer technology greats a high, mile-deep Concours Shine. Now you can create that shimmering shine however you desire with the Wolfgang High Gloss Kit. A total retail value of $93.93. You save $23.94!